Niaux art works, organised by the Gallery in which they occur. 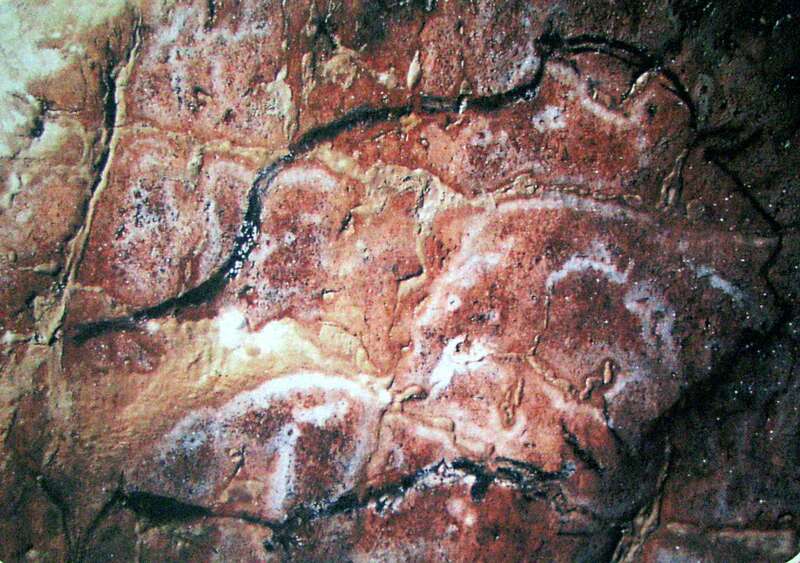 La Grotte de la Vache is important for the complete camp of Magdalenian hunters found, and may be seen almost as it was 12 000 to 15 000 years ago. Weapons, tools, typical game and artworks have been recovered from this small but important site. It was the living quarters for the artists at Niaux Cave, just across the Vicdessos Valley. 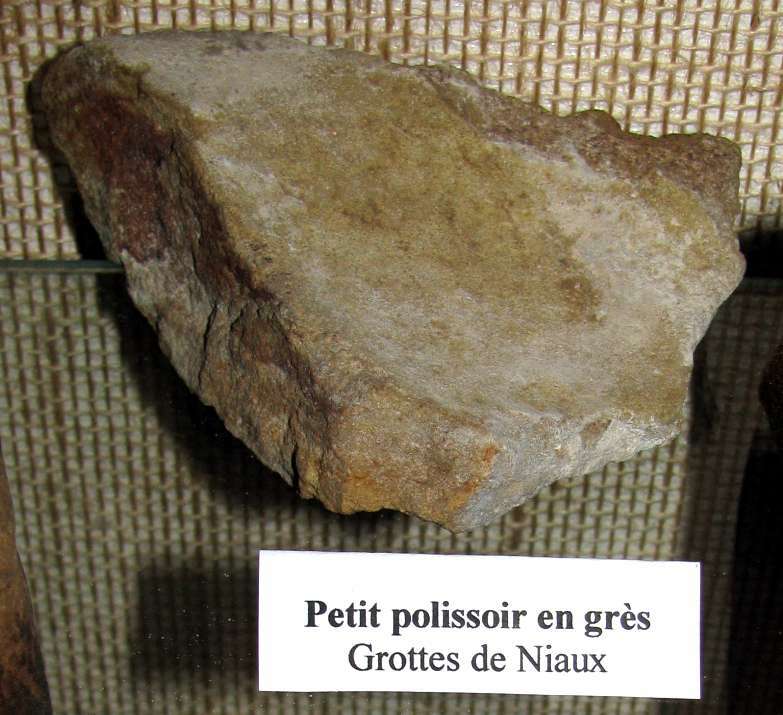 Niaux Cave, or la Grotte de Niaux is one of the most famous prehistoric caves in Europe. 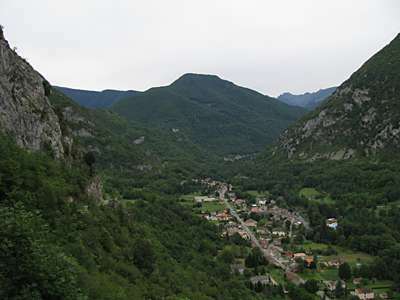 It lies in the northern foothills of the Pyrenees, and is located in Ariège, in the valley of Vicdessos, across the valley from the smaller Grotte de la Vache, in an area rich with prehistoric sites. 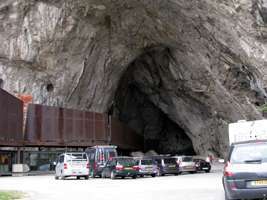 The huge cave entrance, 55 metres high and 50 metres wide, is at 678 metres above sea level. There are more than two kilometres of galleries, with a hundred or more superb paintings from Magdalenian times, most of which are in the famous 'Salon Noir', 800 metres from the entrance. 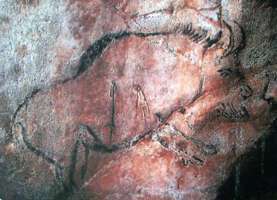 Many of the paintings are done in the classic style of the Magdalenian, outlined in red or black pigment, mostly haematite or manganese dioxide respectively. The entrance to Niaux Cave has been wonderfully done. 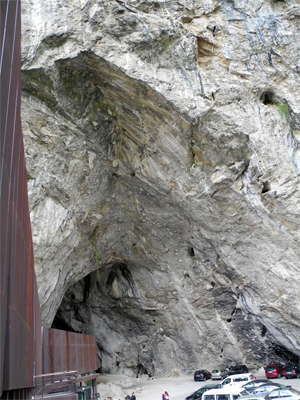 The steel sculpture reflects, in the positive, the negative space of the entrance to the cave. It is a superb work of art, worthy of such an important site. It was designed by Italian architect, Massimiliano Fuksas. 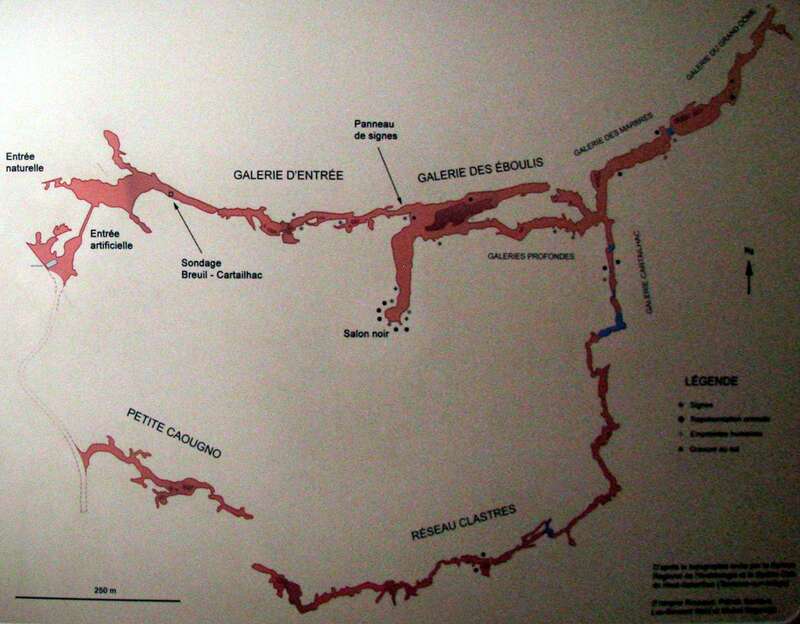 Map of sites in the south of France, including Niaux, showing ice age coastlines. Following an architectural competition organized by the General Council of Ariège, the project of M. Fuksas was selected from among many candidates. The original idea was of a great imaginary animal coming out of the cave, and opening its wings. The sculpture is built of a metal known as Corten steel. Also known as Cor-Ten steel, this material is a group of steel alloys which were developed to obviate the need for painting, and form a stable rust-like appearance if exposed to the weather for several years. The high opening of this structure echoes the entrance of the cave. This achievement is strongly influenced by the famous painter Giorgio de Chiroco met by Mr. Fuksas in his studio in Rome during his youth. 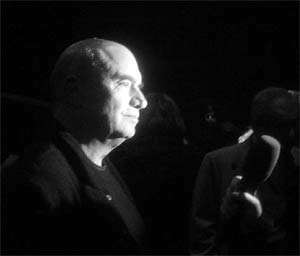 Massimiliano Fuksas is an Italian architect, born in Rome in 1944. He received his degree in Architecture from the La Sapienza University in 1969 in Rome, where he opened his first office. Subsequent offices were opened in Paris (1989) and Vienna (1993). 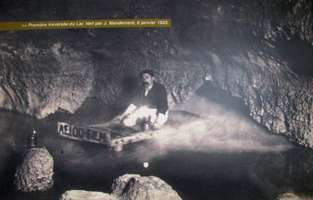 From 1994 to 1997 he was a member of the urban commissions of Berlin and of Salzburg. 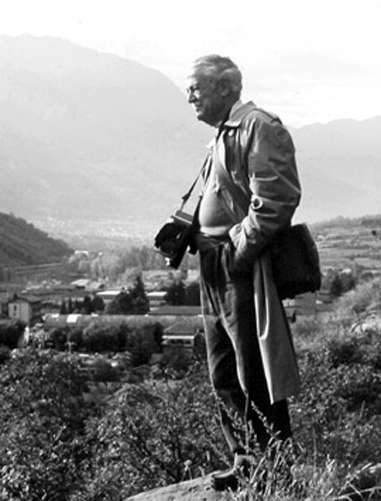 For many years has dedicated his special attention to the study of urban problems and in particular to the suburbs. He is visiting professor at several universities, including the École Spéciale d'Architecture, Paris, France and Columbia University, New York, USA. Permission: This image, which was originally posted to Flickr, was uploaded to Commons using Flickr upload bot on 14:06, 17 November 2008 (UTC) by Luckyz (talk). On that date it was licensed under the license below. The porch of the cave is like the entrance to a cathedral. There is ample parking, necessary because often the tours are full, and one must wait for the next tour. The access road is narrow and steep. 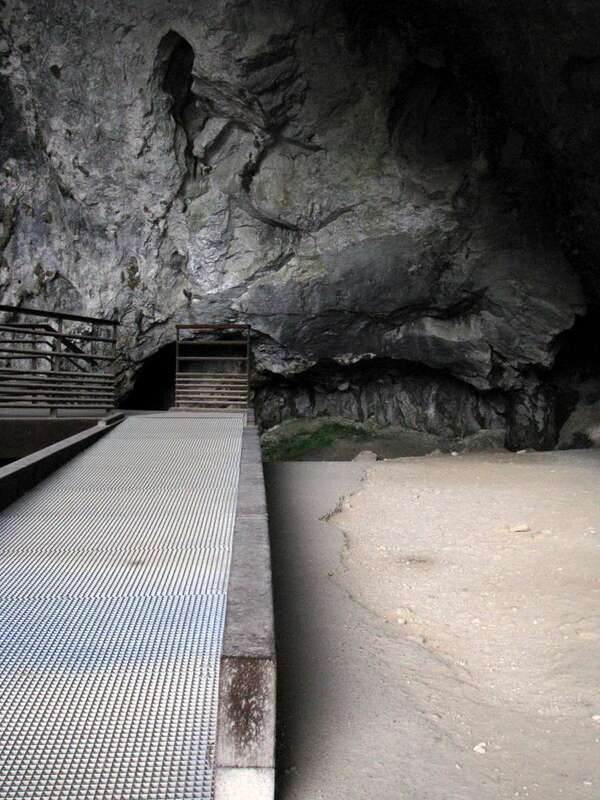 There is a ramp to the observation platform just before the locked gate to the cave, to allow wheelchair access. 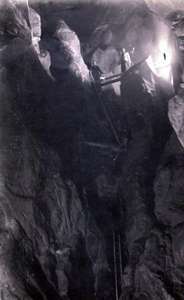 The observation platform has a wealth of interesting photographs and text explaining the history and art of the cave. I was very impressed with the whole concept, the superb sculpture, and the way its internal walls were used in such a clever way. The view from within the cave entrance of the valley below is spectacular. 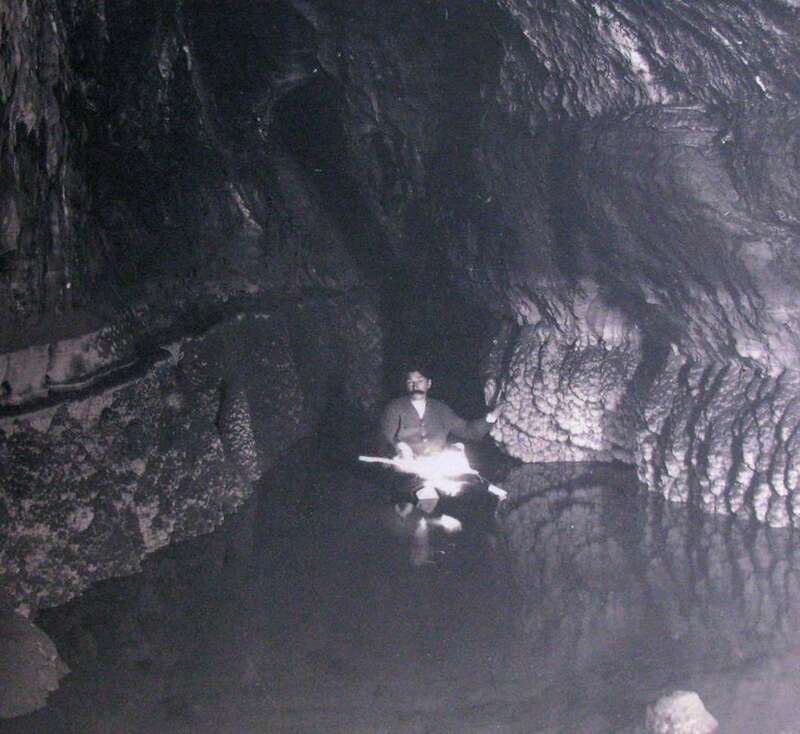 The view from inside the cave circa 1970s. The valley upstream of la Grotte de Niaux is a beautiful sight. During the time that the artwork on the walls of the cave was being created, from 15 000 years ago, the floor of this valley may have contained the remnants of a receding glacier, further upstream, and the glacier may well have been visible from this vantage point, which looks south to the Pyrenees, up the Vic-Dessos valley. The valley floor in front of the cave was green with grass and herbage which attracted ibex during winter and early spring, at the time the artists were hunting them, drawing on the walls of the Niaux Cave, and living in the Grotte de la Vache, five hundred metres away on the other side of the valley. During the last glacial maximum, 20 000 years ago, it would have been full of ice, well above the level of the present cave entrance. The ice of the glacier ground out, like a giant file, the U shaped valley we see today. This photograph was taken from the end of the viewing platform, high above the valley. Panorama from the viewing platform at Niaux, looking up the Vic-Dessos Valley towards the Pyrenees. 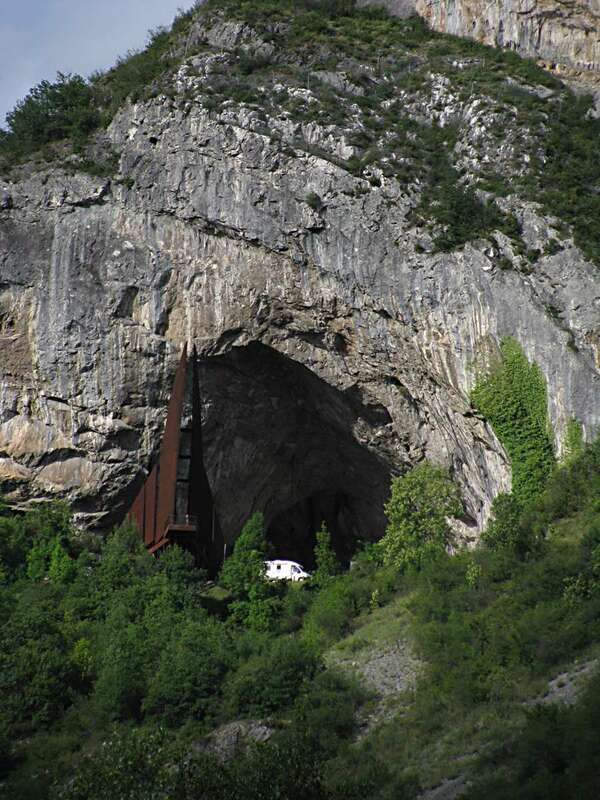 Grotte de la Vache is directly across the valley from Niaux Cave. 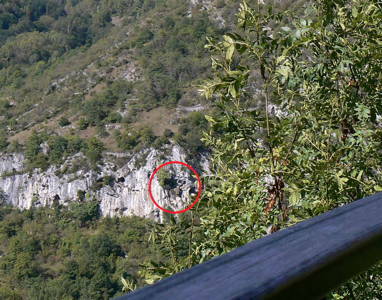 The red circle added to the above panorama shows the fortified cave known as "Spoulga d'Alliat" (see below) and the Grotte de la Vache is about a hundred metres to the right, hidden in this photo by the leaves of the tree. Another view of the fortified cave known as "Spoulga d'Alliat" (see below), again with an extra photo circled to pinpoint its position, about 100 metres to the left of the entrance to the Grotte de la Vache, obscured by the leaves of the young tree at the end of the walkway. Some judicious pruning would improve the view! 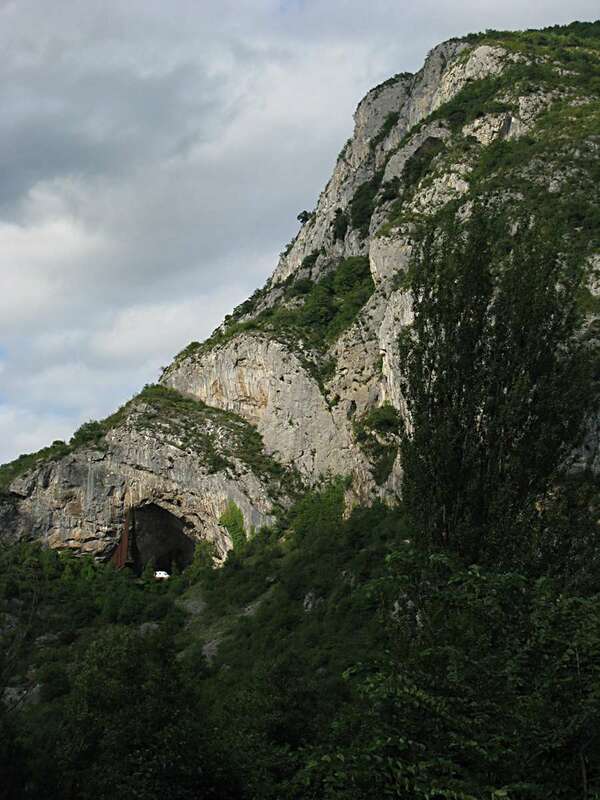 This fortified cave known as "Spoulga d'Alliat", about one hundred metres before the grotte de la Vache, served as a refuge during the war of the Albigenses. The fortification can now be accessed only by rope. At the time it was in use, it would have had rope ladders or light wooden ladders which could be pulled up after everyone was safe in the fortification. They would have needed a lot of food, water and other supplies if there had been an extended occupation of the area by enemy forces, and the safety of the occupants would have depended on their location being secret. An occupying army could have soon breached the defences of this little place of refuge, if only by seige. The Albigensian Crusade or Cathar Crusade (1209–1229) was a 20-year military campaign initiated by the Catholic Church to eliminate the Cathar heresy in Languedoc. Pope Innocent III declared a crusade against Languedoc, offering the lands of the schismatics to any French nobleman willing to take up arms. The violence led to France's acquisition of lands with closer cultural and linguistic ties to Catalonia. An estimated 200 000 to 1 000 000 people were massacred during the crusade. View up the Vic-Dessos valley from the viewing platform at Niaux, with the Pyrenees, glacier clad in the last Ice Age, in the distance. The valley itself was carved out by a glacier, and was used by humans to hunt ibex when the glaciers started to retreat about fifteen thousand years ago. The toe of the retreating Vic-Dessos glacier was only a few kilometres up the valley at the time. Ibex came down to the sheltered valley in the winter to graze on the fertile pastures. 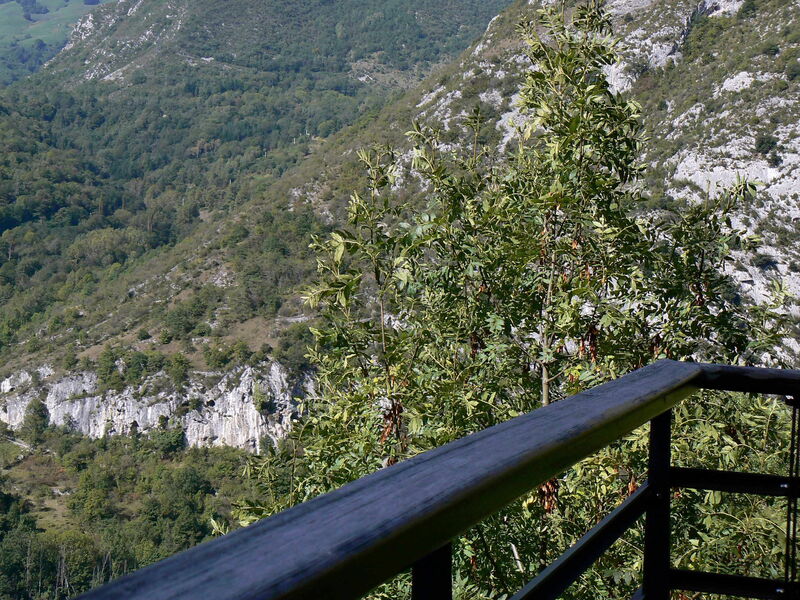 Panorama from the viewpoint at the end of the elevated walkway at Niaux , of the Vic-Dessos Valley. 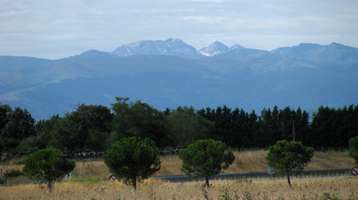 The Pyrenees may be seen through the cleft of the valley on the left. 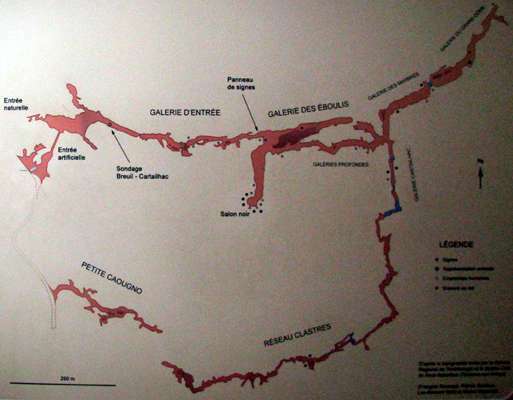 Map of part of the Niaux cave complex. There are more galleries than those pictured here, but many are only accessible to properly equipped speleologists. Note that the map has been drawn with north to the bottom of the image! 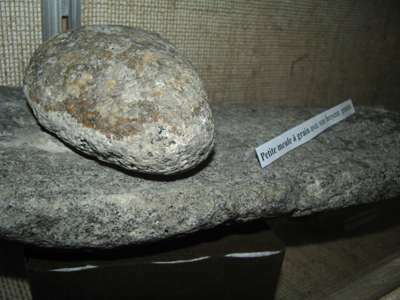 Heel of a broken polished stone axe, found in the porch of the Grotte de Niaux. Possibly Neolithic age. Polissoir, sandstone, used to polish and shape bone, antler and ivory tools. Found in the Grotte de Niaux. 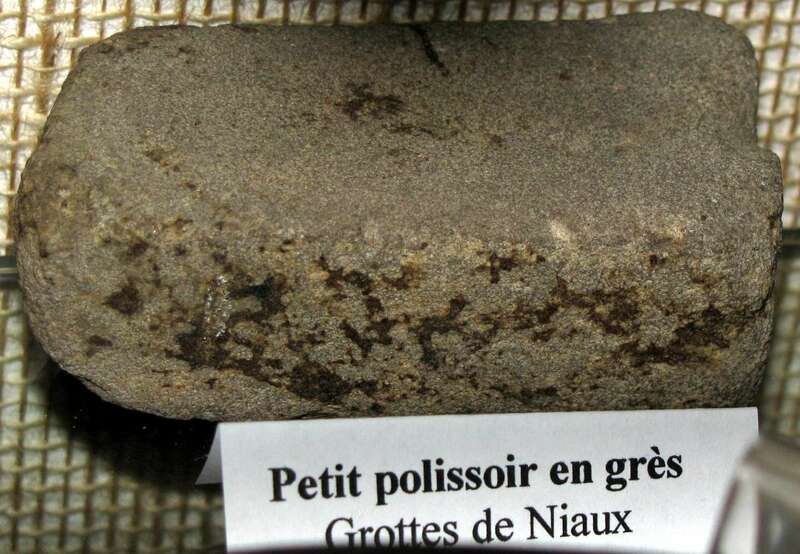 Small polissoir, sandstone, used to polish and shape bone, antler and ivory tools. Found in the Grotte de Niaux. 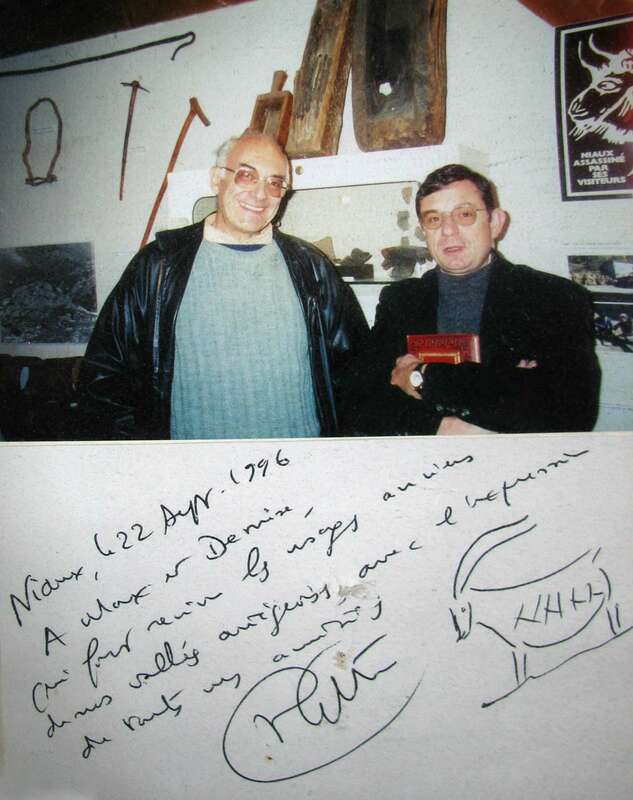 Professor Antonio Beltrán Martínez, 1916 - 2006, known universally with respect and affection as 'Don Antonio' was among the great specialists in rock art, and was appointed Professor at Zaragoza University in 1949. His output was prodigious, and his monograph on Niaux is extremely valuable and authoritative. The water that enters the cave now comes from rains and the melting of snows and feeds the lakes in the cave. The water disappears with ease, however, and in many galleries the off-white line of its previous level may be noticed. The Magdalenian culture arose after the last glacial maximum of the Würm, beginning about 17 000 BP and reached its conclusion at around 11 000 BP. In the present state of research, the magdalenien of the pyrenees appeared around 15 000 BP. At that time, large glaciers covered the greater part of the highlands. At the end of the Magdalenian, the first effects of global warming were already felt. The Magdalenian period had a succession of periods of bitter cold and dry periods, and others which were more temperate and humid. The vegetation and wildlife of the time depended on these conditions. My first view of the Pyrenees, approaching from the north along the main highway which links France to Spain. It is not hard to imagine these mountains covered in snow and ice during the time that the Niaux artists were there, hunting ibex, ptarmigan and salmon during winter. The hills in the foreground would have been covered with snow in winter, but the obviously glaciated mountains on the horizon would have been covered with snow, ice and glaciers year round. View of the magnificent entrance to Niaux from the valley floor. 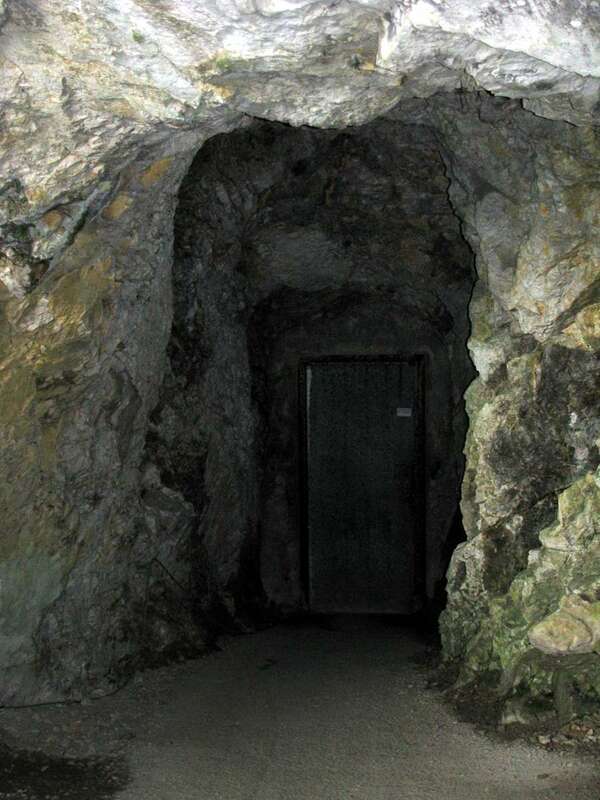 In this photograph, it is more obvious that the entrance to the Niaux cave is so large and spectacular because it was once a cavern deep in the limestone hill, but during the glacial maximum of 20 000 years ago, long before the caves were visited by man, the whole side of the mountain, including a large part of the original underground cavern, was ground away by the Niaux glacier. 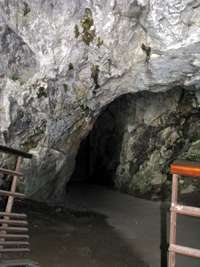 Limestone caves in unglaciated areas are often only found by accident, and have small entrances. In this case a grand entrance arch was created underneath the ice of the glacier, because half the huge entrance cavern was ground away. 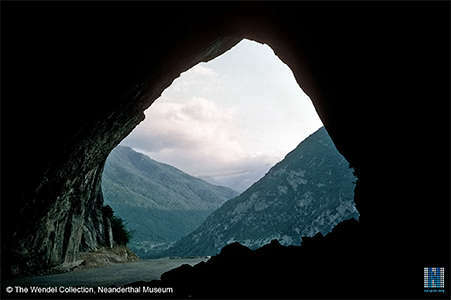 The reason that there are no artworks from the ice ages before the Magdalenian period is that the cave was deep below the ice until conditions started to improve after the last glacial maximum. The Magdalenian was the last flowering of ice age culture, and when the ice age finished, their culture also disappeared because of the change in climate, animals and plants. In this photograph, we can see that not just the entrance to Niaux cave, but in fact the whole side of the valley was been shorn away by the Niaux glacier which once filled the valley, and created the classic glacial U shaped valley. Notice the shape of the valley against the sky. Glacial action always produces this U shape. 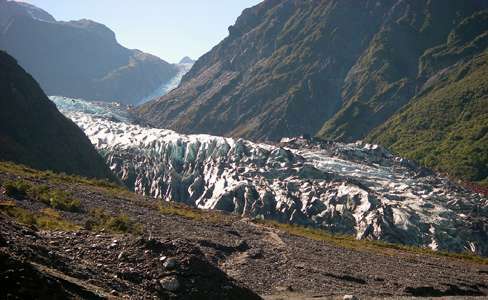 This panoramic photograph taken in the middle of the Fox glacier in New Zealand, in an area of seracs, shows that if a glacier existed above the lush green alpine herb and grass fields which the Ibex sought during winter at the time in the Niaux (Vicdessos) valley, it is unlikely that the artists would have used the glacier as a highway. If they wished to progress further up the valley to explore or hunt game, they would have had to use the valley sides. The toe of the glacier was never more than a few kilometres away. By the time the artists arrived at Niaux around 15 000 years ago, the glacier had melted considerably from its peak 5 000 years earlier. There were, by then, winter pastures in front of the Grotte de Niaux and their winter headquarters, la Grotte de la Vache. 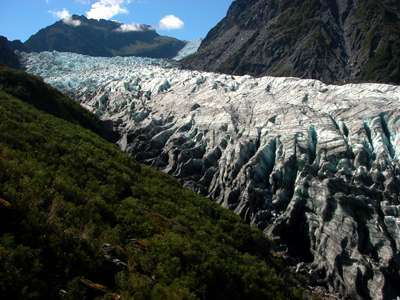 They would have approached the toe of the glacier further up the valley via the flat valley floor, laced with braided streams, as shown here at Fox glacier in New Zealand, then if they wished to proceed further up the valley, they would have been obliged to travel via the valley walls, or at the junction between the glacier and the rock. 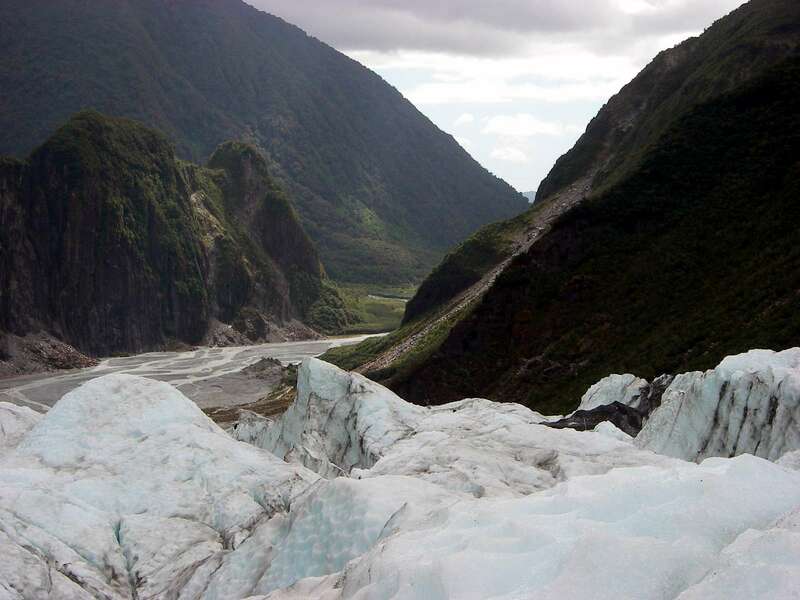 Visitors to the Fox glacier pass beside its icy flanks via a track along the steep valley walls, just as, no doubt, the Niaux hunters did if they wished to explore or hunt further up the glacial valley. The Franz Josef glacier in New Zealand also illustrates the U shaped valley formed by the Niaux glacier. The landform is characterised by a flat valley floor, often with braided streams, and steep valley sides. Where there was a river with overlapping spurs, with a river winding around the bases of the spurs, a glacier acts like a giant bulldozer, truncating the spurs, to leave broad, high cliffs such as those at Niaux and El Capitan in the USA. Glaciers around the world are in retreat because of global warming. 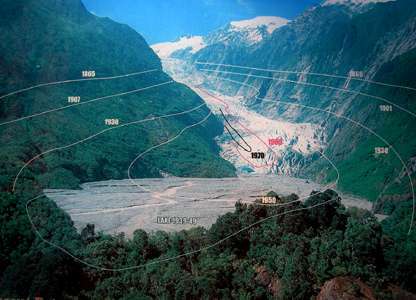 This photograph of a display board shows the extent of the Franz Josef glacier during historical times, and vividly illustrates the speed with which the ice can disappear. The Fox and the Franz Josef glaciers are unique in that they are expanding in size because of global warming. 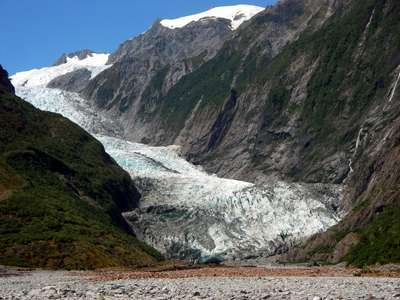 The glaciers are on the west coast of New Zealand, and the warming of the Tasman Sea has meant more humidity in the air, and the resultant increased precipitation of snow has meant that both glaciers have started growing again since 1970. It is a complex relationship between increased snowfalls (leading to an advance by the glacier) and increased temperatures (leading to retreat of the toe of the glacier) which determines whether a glacier increases or decreases in size and length. 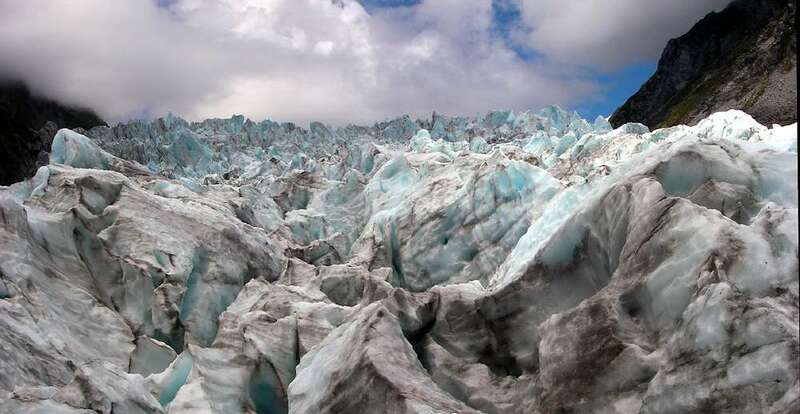 These glaciers have a lot of catching up to do before they reach historical levels, as illustrated in this excellent display by the NZ Department of Conservation. 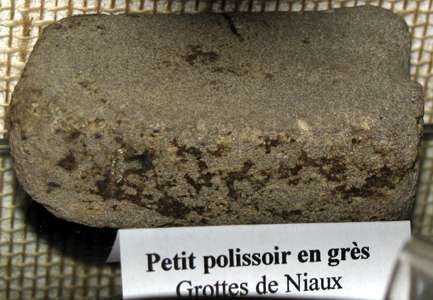 There are a number of things about the Niaux site that are not apparent to most visitors. It is heavy going, I have tried to make it as accessible as possible, but still the whole thing is meant for other scientists, not the general public. 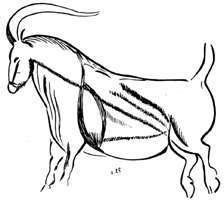 What is most important is to realise that the hunters were there right through winter, feasting on the ibex (bouquetin) which came down to the rich pastures in front of the Grotte de la Vache and Niaux, when the mountain pastures of the ibex were under snow. Then in late spring / early summer the hunters went down to the plains to hunt bison and horses and so on, returning in late autumn to again spend winter in the relatively benign environment inside the Grotte de la Vache, which maintained a constant temperature year round of 12 or 13 degrees celsius, about 54 - 55 fahrenheit. Take especial note of the area where they sat in front of the fires, swapping tall stories, feasting, laughing, and preparing hunting tools and pieces of art. Outside, conditions were cool to cold, and they would have needed warm furs when hunting. 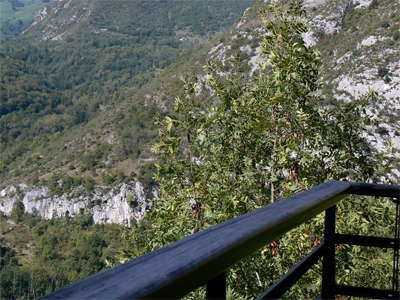 It is well worth while taking the tour at the Grotte de la Vache. It is on the other side of the valley, just a few minutes away, and there are few tours, and not many visitors, since the owners and those responsible for publicity have obviously no idea of its real importance as the home of the artists of Niaux. The tour when I was there was all in French, though the guide spoke reasonable English, and occasionally gave me a shortened update in English, though I gained more from her French explanations, which were much more detailed. I speak enough French to get by, and ask intelligent questions, but I understand a great deal more of what I hear than I can put into words. The owners of the Grotte de la Vache should do as the owners at Cap Blanc have done. At Cap Blanc, all they had was a single frieze of sandstone sculptures, yet it is a highly successful tourist destination. The reason is that they have put a very good interpretation centre in front of it, with a very good display. Then they have a scripted an interesting "tour" (there is just one relatively small area into which the tourists go to view the sandstone frieze) and they tell a good story. I believe that people want to learn something when they go to caves such as Cap Blanc and Grotte de la Vache. 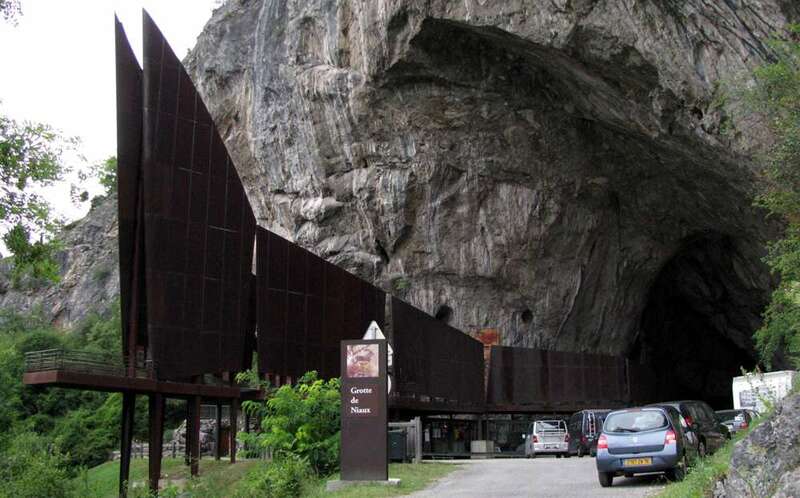 Grotte de la Vache has a much more interesting story than Cap Blanc, yet it gets one tenth of the tourist traffic. The reason is that there is no interpretation centre or museum where those waiting for a tour can browse the displays, and learn something. The museum should allow photography, as Cap Blanc does (though not in the sandstone frieze area, sadly) and the exhibits should be museum quality replicas. A comfortable, well lit and interesting place to wait for the next tour would double the tourist numbers to Grotte de la Vache inside one season. Permission to photograph at archaeology sites and in museums in France bears no relation to either common sense or consistency. Of course, no one should photograph (with flash) the paintings themselves, that goes without saying, as the flash may well degrade, not the pigments (manganese dioxide for black, various iron oxides for red and orange, flash would not affect those) but the organic binders (possibly bird egg yolks or whites, possibly blood, possibly other organic materials such as animal fats, there is little information on that) which stick the pigments to the wall. But with modern cameras, you can get a quite decent image, even with only the available light from the flashlights and other fixed lights used by the guides. I realise that many people have no idea how to turn on or off the flash on their cameras, but an exception could be made for those who do. Perhaps they are trying to maximise their income from postcards and books, but it is a shortsighted policy. I am pretty sure that my website, for example, has motivated many people to go to little known sites that they would otherwise have passed by. No photography is allowed within Niaux, and fair enough, I guess. 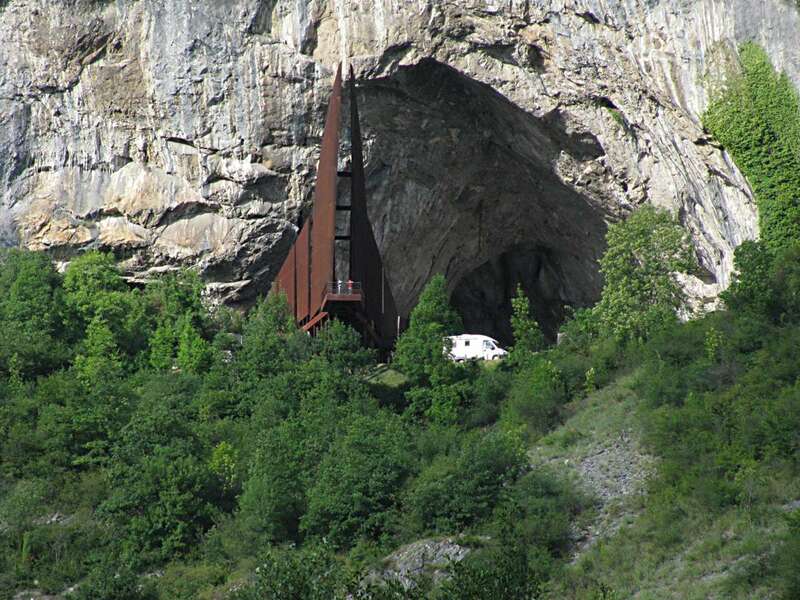 When I was there I had no idea of the importance of Grotte de la Vache across the valley, five hundred metres away. I took a photo of the valley, more for completeness sake, just as a record, from the fantastic viewpoint at the end of the walkway between the sides of the steel sculpture jutting out into the valley. I have since obtained good panoramic photos of the valley from generous people who took photographs for me, which are now on the site. My sincere thanks to Elise Meyer and Joe Hamelin. If you do go to Grotte de la Vache (highly recommended) any extra photos of the inside of that cave would be appreciated. 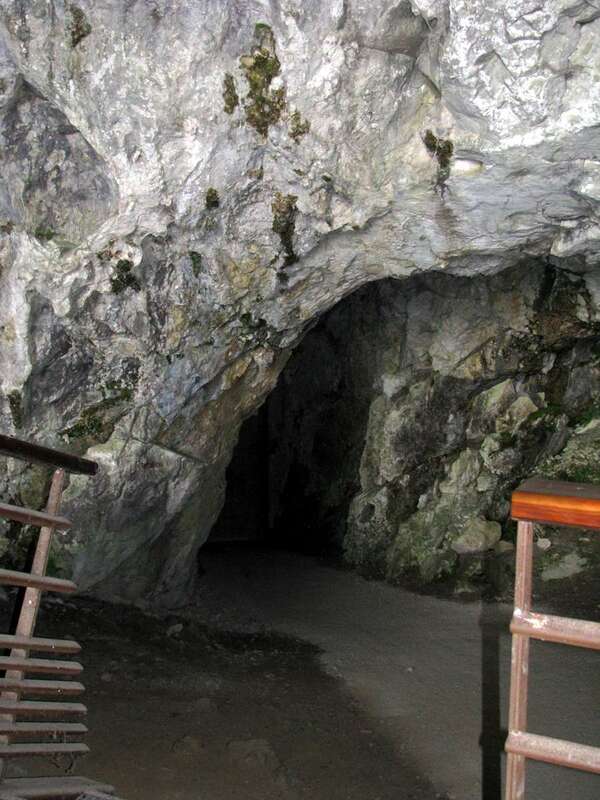 They allow you to use flash inside the cave, but they do not allow you to take photos of the display, flash or no flash. As I said, there is no logic involved. Though I am speaking of 2008, so things may have relaxed a little. Also they may well have found extra things inside the cave, that happens regularly also. You should realise that few tours are in English, a working knowledge of basic French is a real advantage, though not essential if you are interested solely in the experience of being there, and seeing the images on display. 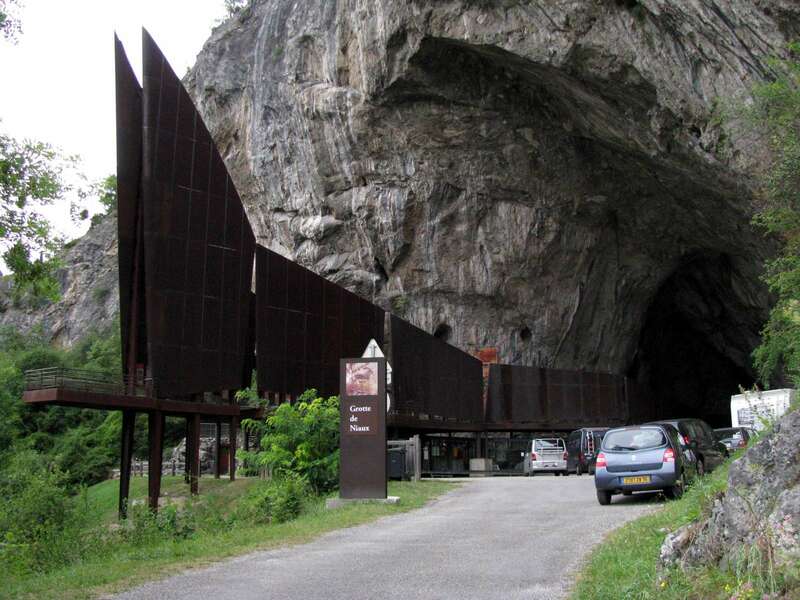 I highly recommend setting aside an hour or so to tour the display outside the Niaux cave but inside the magnificent steel sculpture which juts out from the cave. I have a fairly complete photographic record of those photos, which unfortunately have been degraded somewhat by time and light in the exposed conditons of the steel sculpture, but nevertheless are a very valuable record and resource. 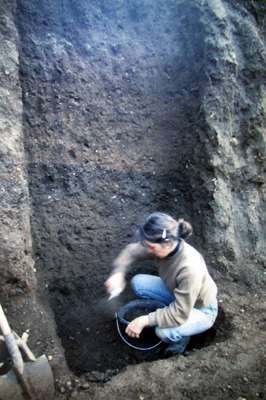 The landscape in which the Magdalenian culture evolved has been reconstructed thanks to the study of fossil pollen (palynology) and charcoal or wood contained in archaeological sediments. In the Pyrenees, at altitude, the presence of glaciers permitted only the growth of Mountain Pines, Pinus uncinata, and juniper trees Juniperus communis. On the plains, it was a steppe landscape of herbs and grasses, with daisies (Asteraceae), sedges (Cyperaceae) and plants such as Tarragon and Wormwood (Artemisia) adapted for the peculiar ecological niches in valley bottoms and along rivers, or in sheltered areas. The Magdalenians were hunter-gatherers, and therefore they could not live all the year in the same place. Their life was to some extent dictated by the movements of the animals they hunted. In Ariège, it has been shown that the sites were mostly occupied during the winter season. The study of faunal remains show (including at the Grotte de la Vache and Grotte des Eglises) that ibex were hunted mainly when they descended to the high valleys at the beginning of winter, during the period of rut. Ptarmigans descended from the heights at the first cold and salmon ascended rivers and began breeding in earnest after the first heavy frost of winter. 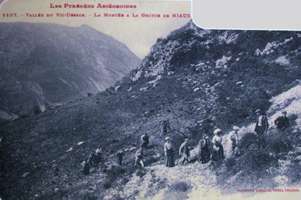 It was a set of conditions favourable for the occupation of the Ariège valley during the winter season. Many other indices allow us to confirm the nomadic life of the Magdalenians, such as the displacement of various materials. High quality flint from Bergerac and perforated seeashells from the sea have been recovered from local sites. A carved sperm whale tooth was found at Mas d'Azil. The exchange of material is simply too prevalent to be accidental. Finally, precise analysis of growth rings of fish vertebrae can accurately reveal the fishing season, of salmon in particular. I. The Access Gallery. Without recorded paintings throughout about 500 metres. II Continuation of the gallery with four groups of red signs in the space of 100 metres, from the "underpass" to the "great crossroads" by the "gallery of the tunnels". 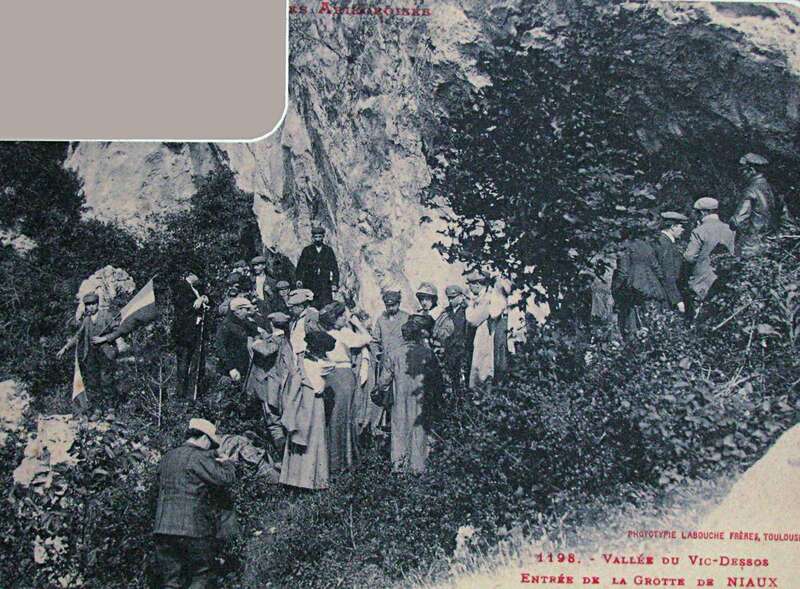 IV "Runner of the loosenings", or section with rockfalls, with engraving number 124. V. A Gallery that goes to the "Black Hall", or "Salon Noir" more than 25 m wide, with great "mountains of sand", engravings in the ground and a large painting set in the roundhouse/rotunda. VI A Deep gallery, that begins with a painted bison and has numerous paintings and engravings, isolated from the others, and ends at the "kettle hole", produced by a collapse, and a new crossroads. VII. From north to south, the Cartailhac Gallery, with the "Green lake" closing it and black paintings and a red one past this one. It is continued by the Reseau René Clastres. VIII. Continuation of the deep gallery by the sector of "beautiful marbles", very eroded and with vibrant colors, but without rock art. IX The "Final Lake", with diverse paintings in red and black on the ceiling, and past this one, the great gallery, as soon as explored, with powerful rockfalls of blocks of great size and an enormous natural cupola of more than 300 m high. There are known, amongst other paintings, two red/black horses, signs and some points. 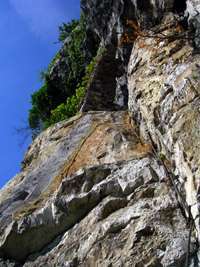 The bottom, obstructed by rockfalls, leads towards the cave of Lombrives. 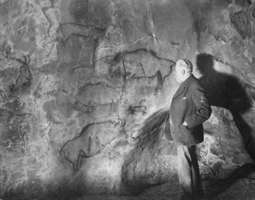 In all the cave there are modern graffiti, some carefully erased by Mr. Clastres; they are from the 19th century, among them is one of the well-known naturalist Nereo Boubée. As far as findings are concerned, we only can allude to those made in the first sector of the gallery, invaded slightly by water and covered by a heavy layer of white limestone; a dig in which R. Simonnet has worked lately has given ceramics at least of the Bronze Age. At 400 metres from the entrance, at a point below a rock, some fragments of ceramics have been discovered, very dispersed. At 611 metres, a line of concretion, white, which marks old water levels of up to two metres. It is very probable that the neolithic people never crossed this zone of quite deep water. The red signs begin here. In the Black Hall it seems that Molard discovered some rare units of quartz, some fragments of bone, disturbed, and a piece of a Magdalenien needle, until now the only found palaeolithic piece in Niaux. "the drawings do not seem to be the result of a line drawn with a stick of charcoal. A brush and a black mixture of charcoal and manganese oxide, probably with fat, were used to do the paintings." The problem was then considered solved. 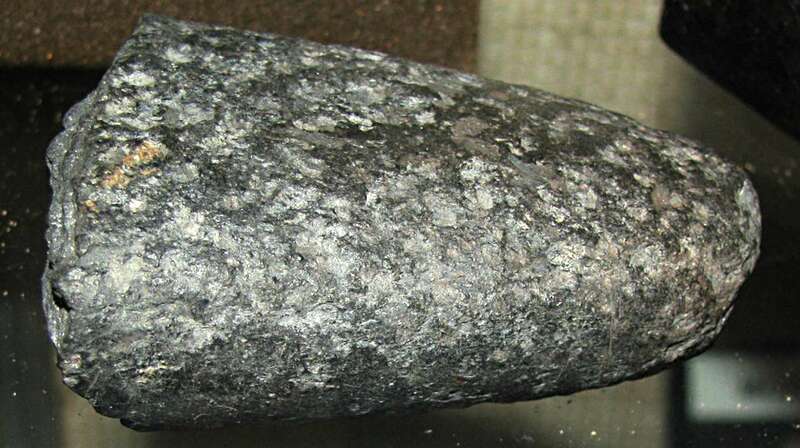 It was not until 1981 and 1990 that samples were taken to determine the nature of the materials used. There had been many drawings by the technique of charcoal but these were just sketches intended to map out the final drawing, or painting, which covered them. The painting included three major components: a pigment that gives color (black Manganese dioxide and sometimes charcoal, red hematite, an iron oxide), a binder (water, animal or vegetable fat) which ensures consistency and fluidity of the paint, and Potassium Feldspar, sometimes with biotite, or talc, which improved the opacity of paint. 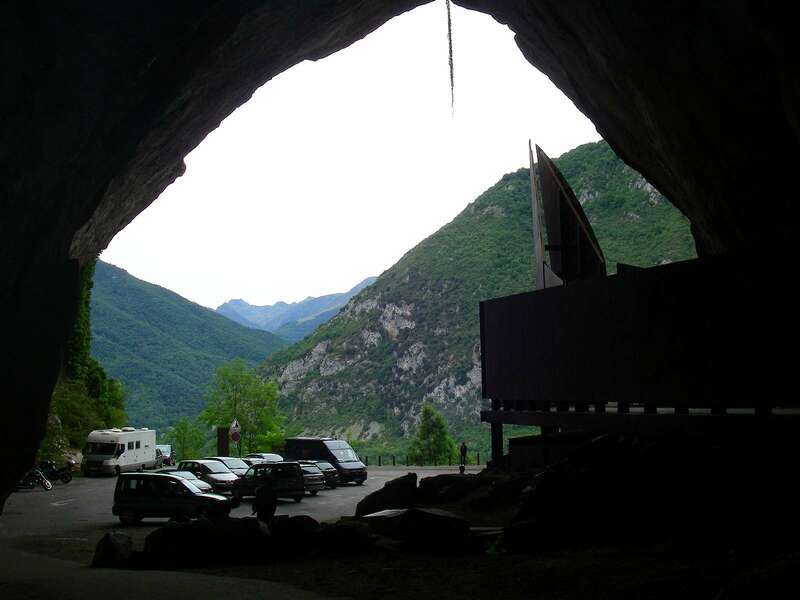 Dating at Grotte de la Vache, just across the valley, a place where thousands of bones and many artefacts were found. 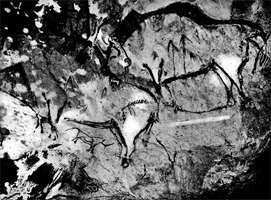 Note that these dates agree very well with the dates for the paintings in Grotte Niaux just across the valley. 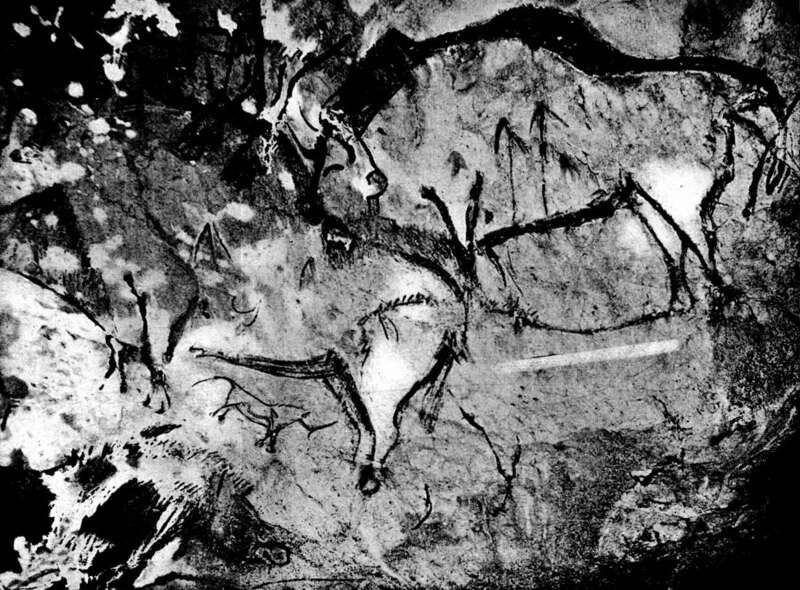 It would appear that Grotte de la Vache was used as a living area, and the Grotte Niaux was used exclusively for artworks, by the same people. 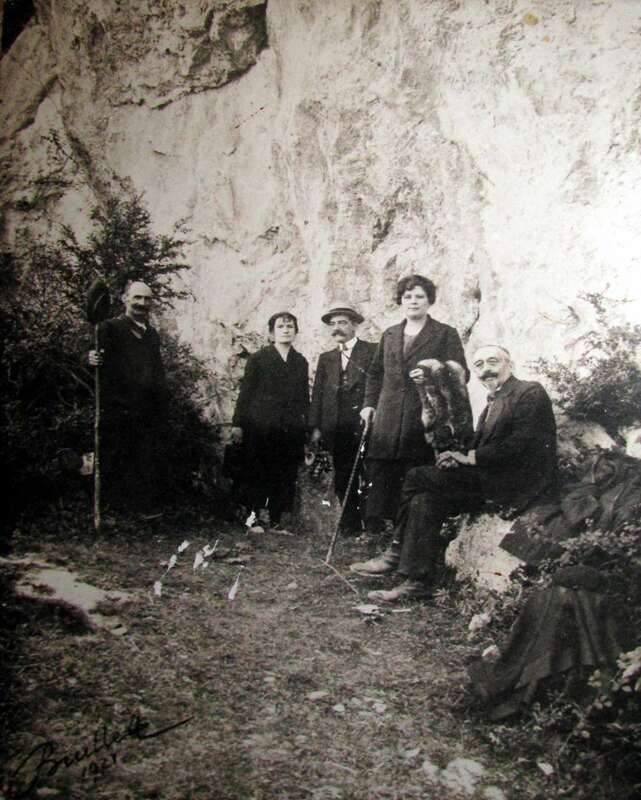 Visitors to the area in 1921, about to go to the Grotte de Niaux. First crossing of the Lac Vert, the Green Lake, 770 metres from the entrance, by Joseph Mandement, 6th (or 8th) January 1925, on an improvised raft. He took advantage of a period of drought, when the lake was reduced in height, and noting that the gallery continued past the two to three metre wide Lac Vert, he crossed the Green Lake (variously identified on maps as Lac 1, Lac Vert, or Lago Verde) and after breaking a 50 cm high barrier of limestone concretions gained access to the Cartailhac Gallery. This unblocking allowed the discovery of some additional drawings in the Cartailhac Gallery: two ibexes, a bison with a black head, a probable bison, and numerous red and black symbols. In this photo we may see the limestone concretions, extending from the roof, exposed by the low water levels, which M. Joseph Mandement was able to break away in one section to gain access to the gallery beyond. Joseph Mandement, crossing the little lake at the end of the Cartailhac Gallery, August 1925. After Niaux was discovered, it became fashionable to make the trip to the Pyrenees and admire the art works there. 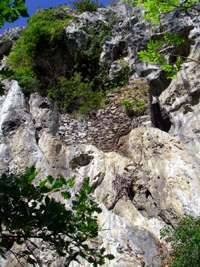 At the time there was no road to the cave from the valley floor, so it was necessary to climb up via a walking track, which was steep in places. Parts of the cave involve steep ascents and descents. 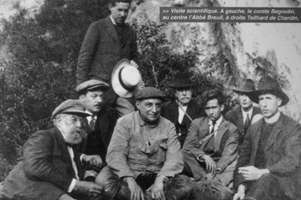 Count Begouën in front of the last panel of the Salon Noir in 1927. Scientific visit. On the left, Count Begouën, in the centre L'Abbé Breuil, on the right Teilhard de Chardin. Our exploration, was hampered for a time by a vast lake formed across the first room after it took a fortnight for all the snow to melt. The snowmelt has spread to every corner of this vast cave, 1100 metres long. In the first gallery, 600 meters long, one does not meet any figures of a symbolic nature. Over much of its length, it has a floor covered with a shallow puddle of water, but water several metres deep has left a line of concretions on the walls showing their old level, and partially covers some red figures. 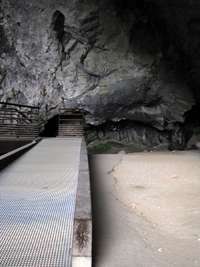 The time when these bodies of water formed an impassable barrier across the gallery is later than the red marks and must match the neolithic and bronze ages, and is the barrier that prevented the Neolithic people and their successors penetrating Niaux as they did in the nearby cave of Ussat. This first gallery, towards its end, takes on a different aspect. The floor dries out, one walks on sand, with pebbles of crystalline rocks, and soon we reach a wide low room. To the right as we enter, we pass an angular rock covered with many red signs, pointing in different directions, symbolic figures. If, in crossing the room, leaving to the right and the left the lateral passages which enter, one goes towards the back of the cave, one finds, at four or five places, new panels of red figures of the same family as the first, as well as other different ones, similar to a pine branch, or to alphabetic characters, and tectiform signs as in other caves. Some very simple animal figures, drawn in red and black, are mixed in as well. One sign comes particularly to mind, consisting of an elongated axis which swells into a bulb close to one end. This is somewhat reminiscent of the clubs painted by Australian Aborigines on the walls of their caves. and there is no shortage of parallels with the boat shaped Altamira signs. At the end of this completely dry gallery, the ceiling plunges abruptly to the surface of a small lake that we have not crossed and that frequently invades a portion of the corridor nearby. In sum, in this gallery, as in the first gallery, apart from occasional and simple silhouettes of animals, one does not find anything other than red signs, sometimes black, sometimes grouped like an inscription, sometimes only in little very visible groups which remind you of landmarks. It is in the gallery to the right, 800 meters long, that Commandant Molard and his son saw the first black figures drawn on the wall, which brought Mr. Cartailhac to explore the cave on the 28th September 1906 and to communicate to the Academy the discovery of the 'Salon Noir'. To gain access, it is necessary to climb almost constantly, hills of very fine, dry sand up to the entrance to a large rotunda, with a high dome and walls which are creased to form multiple shell-shaped flattened apses, wide and shallow. Here, spread out over a length of 40 metres, the black frescoes of Niaux may be found. Black Ibex from the Salon Noir. We will not describe in detail these beautiful figures of bison, horses, ibexes, to which must be added a deer and some other figures which are merely a simple linear outline, without shading or marking of the coat, nor rounding of the bodies of other animals. Are these preliminary drawings or did they not care to complete them? It is difficult to say. From the beginning, the Academy has been informed of this fact which deserves attention that a number of bison and ibex appear pierced with arrows, and one of us assumed it was probably a new index for interpretation of magical works of art from the Quaternary. Today, we can put in front of the Academy some excellent photographs of the murals; they enable you to convince yourself of their high artistic value. The soil of the floor, like any filling of the cave, is composed of materials that have penetrated when the last glacier filled the valley Vic-de-Sos, pebbles and granitic sand, clay shale from schist. Except in the access gallery, where water infiltration has formed large stalagmitic floors, the ground has undergone no change since the time of glacial retreat. Drips of water from the roof are rare, the soil is completely dry. In the "Black Room" the floor is composed of hard clay that is dry and cracked. Although modern visitors have trod its surface, it has kept intact the slightest vestiges of the feet of a goat, lost 700 metres from daylight, and who vainly sought an outlet in every corner of the wall: the imprint of his feet is as fresh as if they had just left the ground they scored: the body of this poor beast is still there, of which there remains only bone fragments falling in flakes: this contrast is disturbing and shows that there is not the slightest trace of sustenance in these places. Fish, a trout or salmon, engraved in the compacted sandy clay of a side passage, at the entrance to the Salon Noir. It is on the same floor, in two narrow passages at the entrance of the "Black Room" we find the some designs: two fish in one, an ibex, a horse, and an ox, a bison on the left. Another twenty at least are found in the black frescoes. 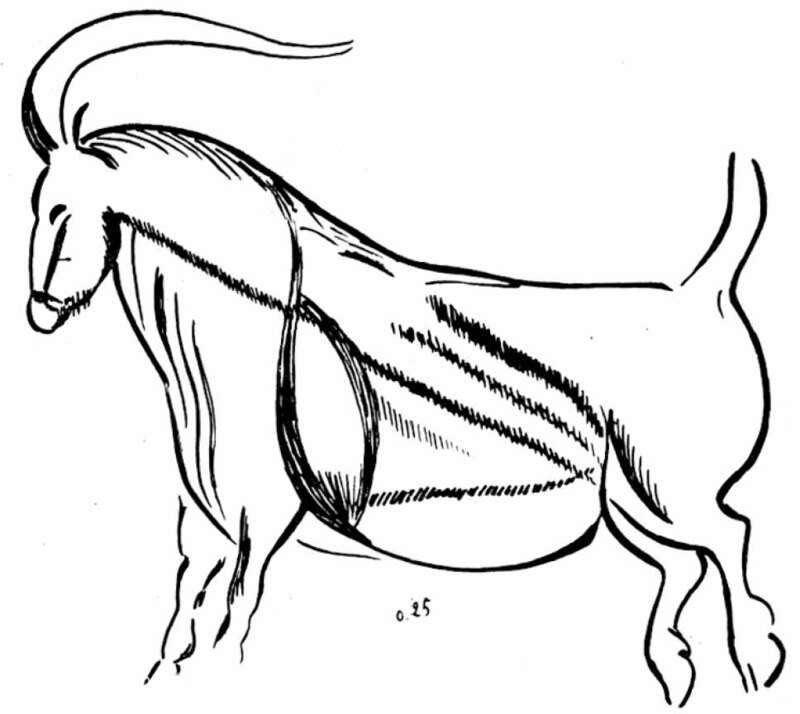 One drawing, depicting a bull, was found in the rest of the cave at the foot of the great pile of fallen rocks which completes the left side gallery. At two points not trodden by the feet of modern visitors, we noted at a similar but softer soil surface, the impression of the bare knees of a man who had crawled under a low arch and those of many bare feet also belonging to adults and children. 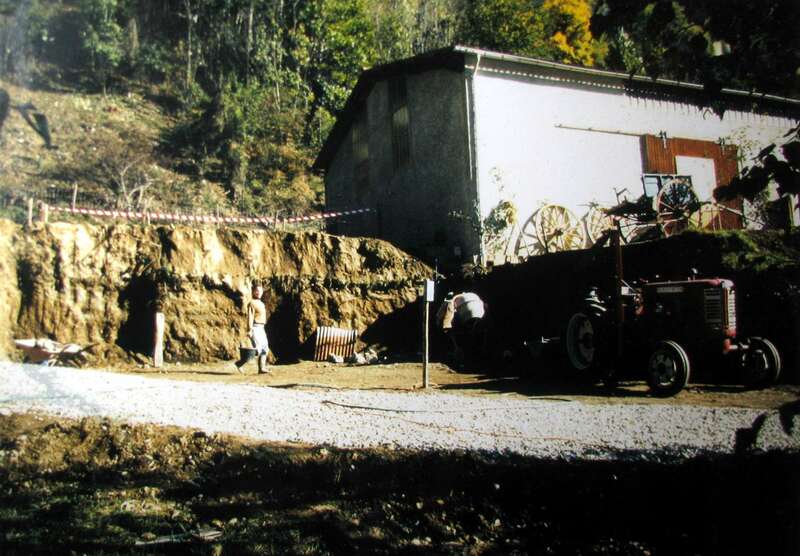 Digging the foundations for extensions to the museum in 1986. While digging the foundations, the opportunity was taken to make a search for artefacts. 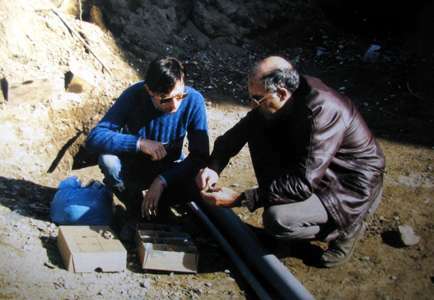 Jean Clottes with the owner during the digging of the foundations for extensions to the museum, in 1986. On revisiting the area ten years later in 1996, Jean Clottes posed for this photo with the owner. Polished jasper axe. Jasper is a tough, fine grained and beautiful stone suitable for stone axes. 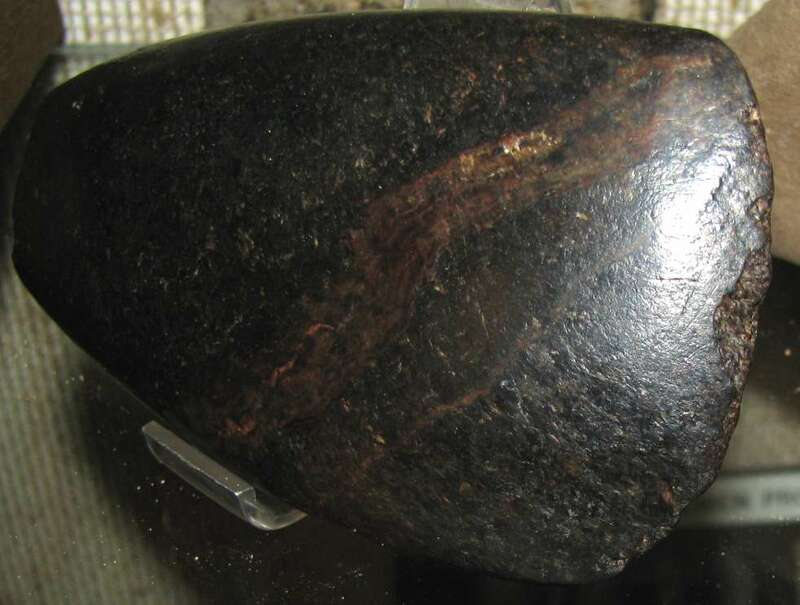 The polishing of such a stone involves many hours of hard work, grinding and polishing. This example was found in the Ariège area, but its exact provenance is unknown. Granite mortar and pestle, used for grinding grain. Breuil, H., Cartailhac É., 1907: Une seconde campagne aux cavernes ornées de Niaux (Ariège) et de Gargas (Hautes-Pyrénées). Comptes-rendus des séances de l'année.. - Académie des inscriptions et belles-lettres, 51e année, N.4, 1907. pp. 213-222. Rappenglück, M. , 2002: The Claviform P-Sign a Time Unit? – Interpreting a Palaeolithic Symbol, TIstorija i kultura vostoka Asii, Tom I, pp. 224-229. Novosbirisk: Institut archeologii i etnografii SO RAN, 2002. Sieveking, H., 1979: The Cave Artists, London: Thames & Hudson, 1979.